Friends, we’re back! 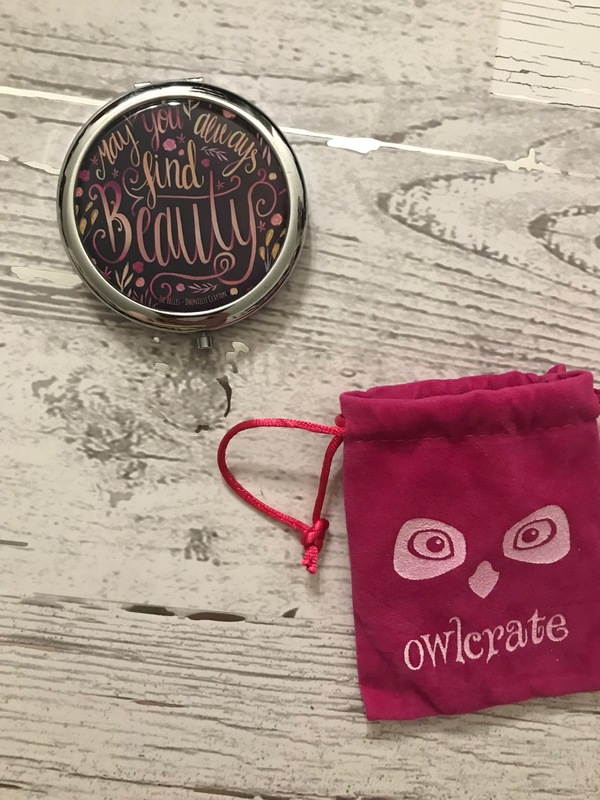 I had the incredible pleasure of unboxing another OwlCrate this month. I didn’t know as many of the references as I had last month, but I’m still excited about the box. Please be warned, there is nothing but spoilers ahead. If you haven’t received your box yet, don’t hit that read more tab! 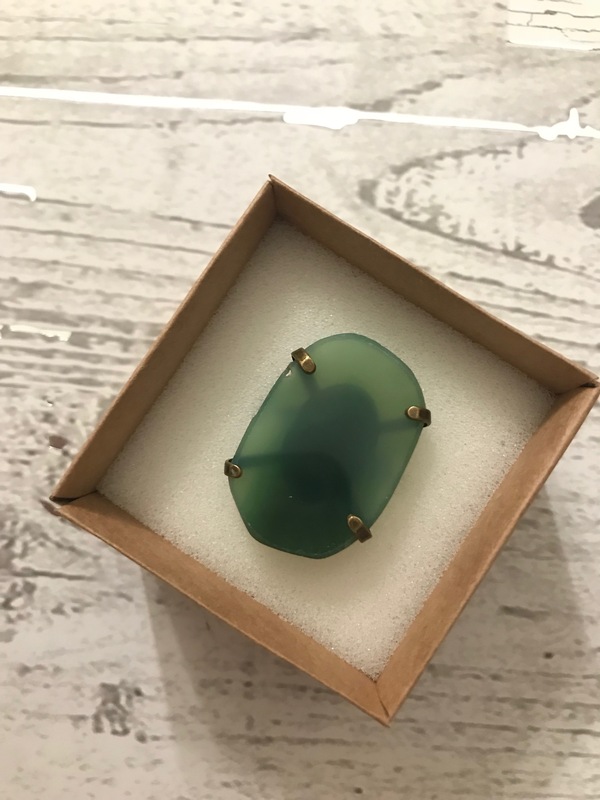 One of the first things I got was a large, green agate ring. I like that it has an expandable band, but it isn’t very comfortable for me. I still think it’s a wicked cute accessory, and I may use it for photos now and then. This comes from GeoCentral. Next, I pulled out a really neat box. This bad boy is shaped like a book, but it’s metal with quotes on it! There are three different quotes; one each on the front, back, and inside. 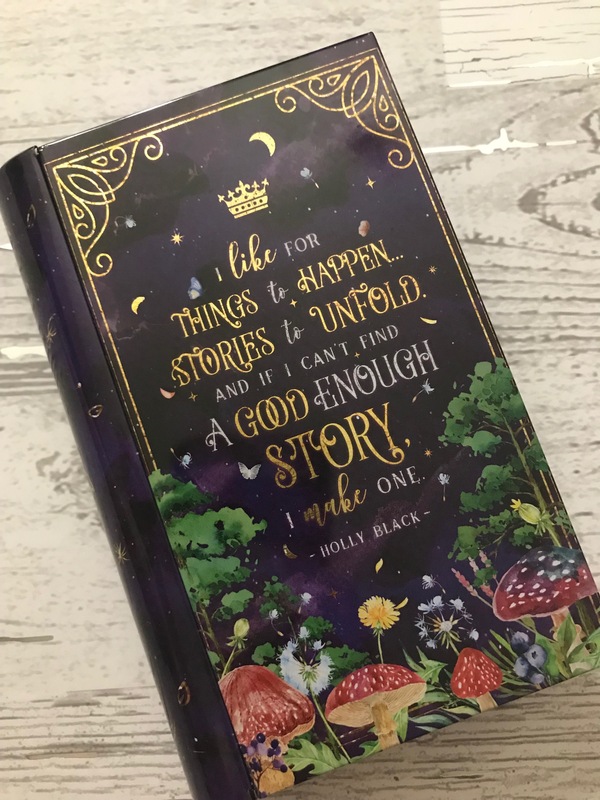 All of the quotes are from Holly Black, author of The Cruel Prince. This box is made by Stella Bookish Art and I’ve already moved it to work, so I can have a little candy stash. Another item in the box was a beautiful compact mirror. The front of it reads “may you always find beauty.” I think it’s lovely, and I’m really excited because all of the mirrors I get usually are not compacts, and they can get damaged. But this feels pretty heavy duty, and I’ll feel safer just tossing it into bags. 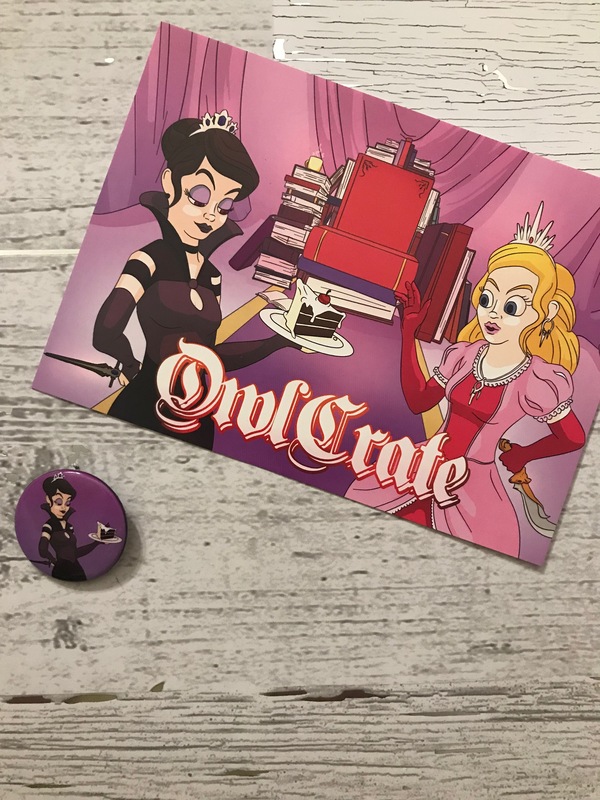 The design is inspired by The Belles and lettered by Catarina Book Designs, plus it’s an OwlCrate exclusive! We also got a home goods item in this month’s box. 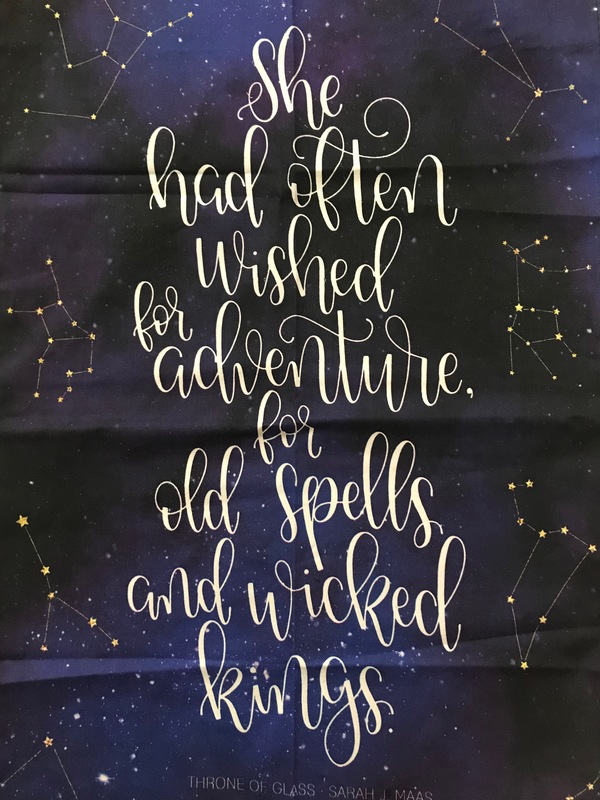 Everyone got a tea towel that is covered with constellations and reads, “She had often wished for adventure, for old spells and wicked kings,” which is a Sarah J Maas quote from Throne of Glass. I think this may be more of a decorative piece, as it isn’t terrycloth, and doesn’t feel like it’d soak up moisture all that well. But it’s beautiful, and designed by Little Inklings Design. 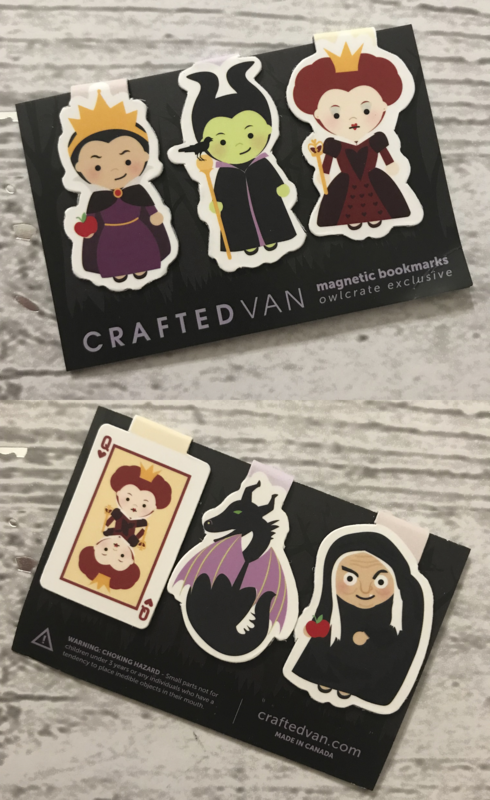 We got the cutest magnetic bookmarks this month! Since the theme was Ruthless Royals, we got three Disney royals in bookmark form. These tiny cuties are Maleficent, the Evil Queen from Snow White (Grimhilde, in the old fables), and the Queen of Hearts. On one side, it shows them in their human forms, and the other has their transformations (dragon, crone, and card). I’ve never used magnetic bookmarks, but I’m excited about these, and trying them out. They were designed by CraftedVan. The next item is a promotional card for a book released last year, Before She Ignites by Jodi Meadows. 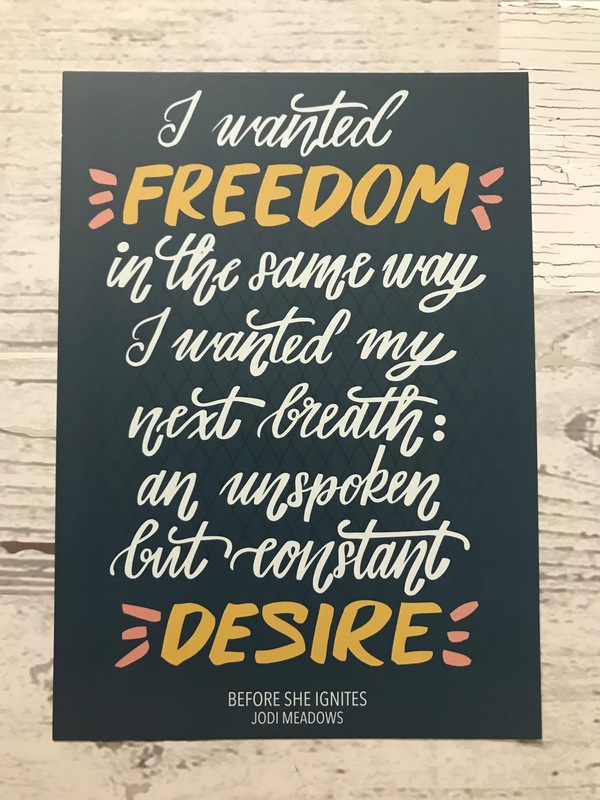 One side features the cover, but the other side is some beautiful hand lettering, “I wanted freedom in the same way I wanted my next breath: an unspoken but constant desire.” That sounds great! I’m definitely interested in that book now. The hand lettering is done by beautifully, but the creator isn’t mentioned anywhere in the box. Of course, we got a little themed button this month as well. It’s the more villainous looking of the two queens on the spoiler card. I’ve seen a lot of people’s unboxing with the same pin, so I don’t think there was any of the other queen. And finally, the book! 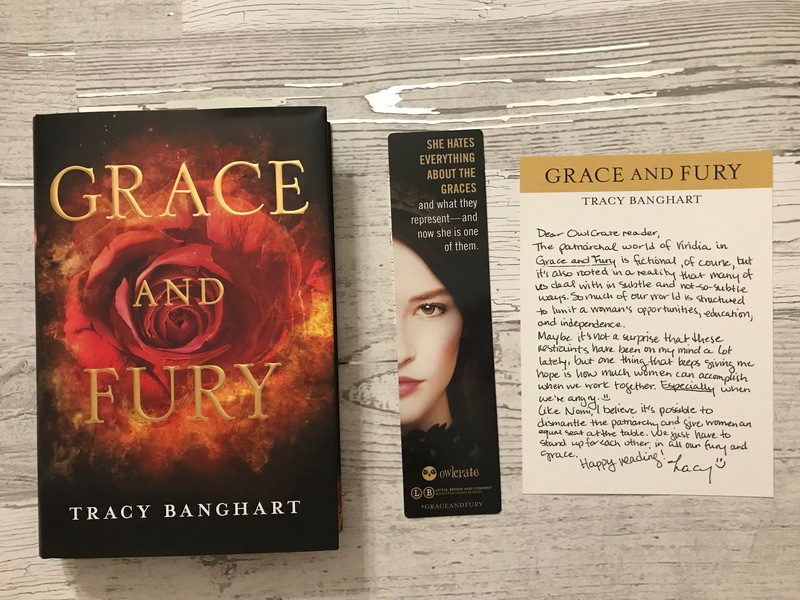 We got Grace and Fury by Tracy Banghart this month, and it looks incredible! The cover is an OwlCrate exclusive, and Banghart signed it as well! I definitely prefer this cover to the regular one, which has two women on it. I think this one is just prettier. This book is about two sister whose lives have been groomed differently. But, things don’t go according to plan (because when do they?) and we have to see how it pans out. I can’t wait to read this; it’s jumping some of the other books in my TBR because I’m so into it. You can check out Target, Amazon, Walmart, and Barnes & Noble for this book! I’m excited for next month’s OwlCrate, which will be Master of Disguise themed. They say that we’ll be getting some items reminiscent of Six of Crows and Harry Potter, which makes me excited. That’s the last month that I’ve prepaid for, and I’m still not quite sure if I’m going to renew. I do love everything I’ve gotten in it, and the price kind of makes sense. I’ll go more in depth on that next month. Either way, happy reading!